This 180 Degree Security Camera is a great way to cover a wide area with a single surveillance camera. This sleek and small dome camera has a 5MP image sensor to produce video that is more detailed than 2K resolution, and has a built-in microphone. You'll be able to listen-in on conversations up to 25 feet away indoors in a quiet room. It is weather resistant and vandal resistant, so it can be used indoors or outdoors without worry. Since this is a network camera, it can be recorded multiple ways, either to one our IP camera recorders or to a MicroSD memory card using the built-in MicroSD slot. The best part is that you can select whether to record audio with video or not. Let's not forget that this camera has real WDR (Wide Dynamic Range) which will allow the camera to handle different lighting levels like in a storefront with windows to produce the best possible image without glare. 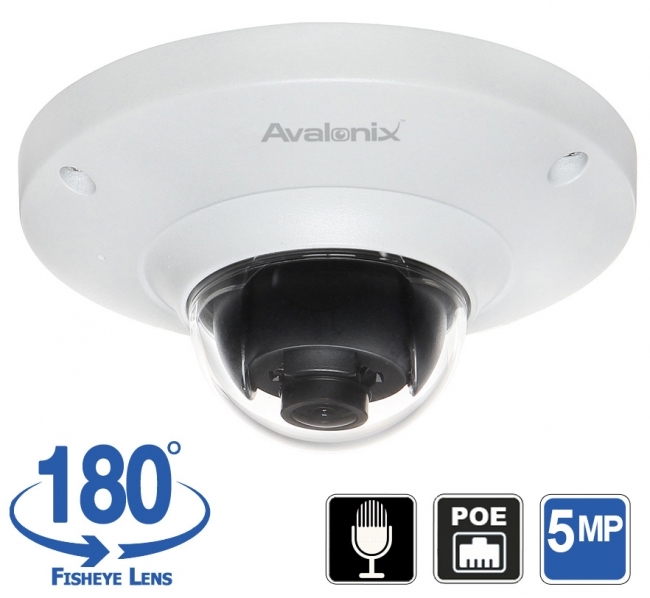 This low profile dome security camera can be powered by a 12V DC power adaptor or a PoE switch. When using PoE, you can either use one of our PoE NVRs or a PoE switch to power the camera over network cabling. Excellent video demonstration. For recorded video (I use BlueIris). If I'm reviewing a recorded video will I be able to zoom in? You will be able to zoom in but you will not be able to take advantage of the de-warp feature of this fisheye security camera. Blue iris doesn't support it.